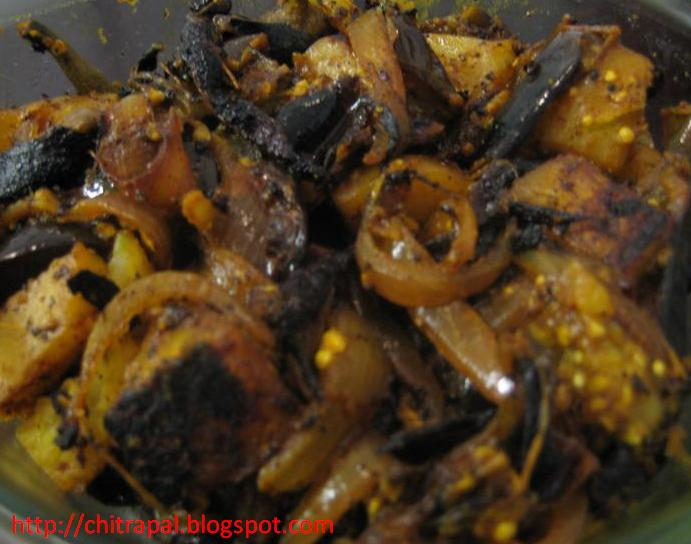 Make a small cut vertically in the eggplants/ brinjal / baingan so that you can fill with spices. Mix all the spices in a bowl and fill in eggplants with butter knife, just leave 1 teaspoon of spices for onions. Keep eggplants aside for at least one hour. Now in non stick skillet put 2tsp. of oil and add onions. After the Onions have turned golden brown sprinkle blend of same spices over it and take them out. In the same skillet add eggplants one by one. Don’t overcrowd the skillet, cook them in two batches. Turn them upside down to have golden brown color on both sides. You can also cook them in oven in a non stick sheet. Preheat at 425 and broil them for 10-20 minutes at 450. Now take a tray and place all the onions on that and then put your eggplants over the bed of onions or mix them altogether and serve in individual bowls.